I would bet that it’s not much of a stretch for you to think of many ways that a farm first aid kit would be needed on a farm in a barn. Tools are sharp, animals get hurt, people get hurt, blood matters and things happen. So why is it that we don’t actually keep our first aid kits stocked up until after an injury happens and we needed clean cloth, bandages or antiseptic? In a perfect world this would be one of the first things to stock in the feed room or barn. Often, the time it takes to run to your house and find the needed medicine or bandaging materials can be too long. So what should you keep on hand? I prepared the following list of what I keep close by in our feed room. It is mere steps away from the animals, chickens and ducks. I can grab what I need to take care of the first aid emergency while holding the animal if necessary. I wouldn’t be able to do that if I had to drive back to the house holding a bleeding animal or while trying to administer any lifesaving treatment. First thing to decide is what to store the farm first aid materials in. I like to use some sort of sturdy plastic box that I can open with one hand. Because I am usually holding an upside down chicken at the time. I will also use an open tool caddy to keep the bottles and ointments upright. Shopping for your first aid supplies doesn’t need to be time consuming or expensive. Look for deals on items while you shop the big chain drug stores. Use coupons from your frequent shopper memberships. Don’t overlook the local dollar store. Bandages don’t have to be a name brand to work. I shop at the local feed supply store, chain drug stores, and online specialty websites. A lot of supplies such as Vetericyn are available through Amazon.com too. Don’t duplicate the items for animals and people. I use Vetericyn wound spray on my hands if I cut myself. Also, Neosporin ointment or other triple antibiotic ointments are fine for people and animals as long as they don’t contain a pain reliever ingredient. This is stated on the label. Animals can react badly to the pain relievers in human medications. Vet wrap is a handy elastic bandage that helps keep a bandage in place so you can use it on people cuts too. Why should your goat be the only one rocking the bright orange bandage? Saline Solution, Betadine solution, Hydrogen Peroxide, Iodine. 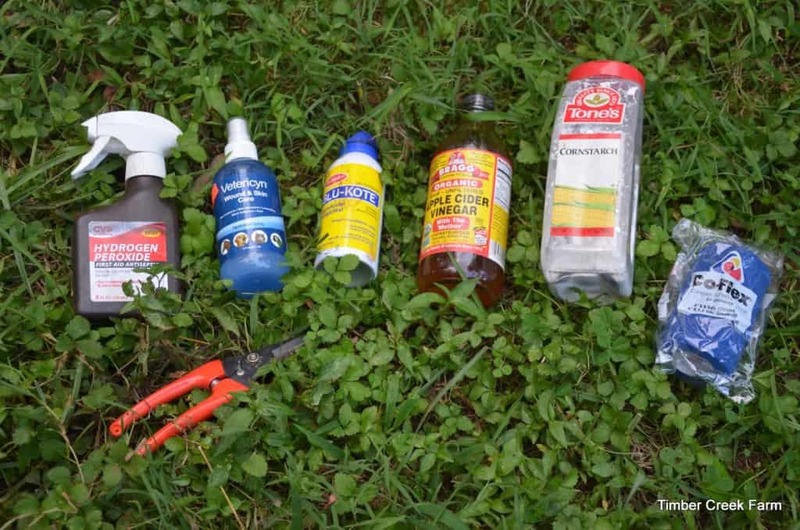 All of these can be used to clean a wound. Saline solution can be used to clean debris or a speck out of an animals eye. I use saline solution frequently to irrigate a cut or a sore, in order to get a better look at what is going on. Saline Solution is fairly inexpensive, available almost everywhere and not harmful to animals or humans. Scissors – An indispensable item. A knife can be used for most cutting jobs, too. but for cutting bandages, I prefer to have a pair of scissors. The pair of scissors I prefer is this one from Fiskars. Disposable Vinyl Exam Gloves – Even if you are not grossed out or squeamish, some things are better off not being handled with bare hands. Infections in wounds are one thing that should be treated while wearing disposable gloves. Also, wearing gloves protects the animal from further infections being introduced to it, while it is already fighting something. Bandages, Gauze pads, bandaids, tapes, Vet Wrap or Co-flex bandage – Buy and assortment of sizes and types. One bandage might not work on all type of wounds. Vet wrap is perfect for over wrapping the bandage because it is sticky and helps the bandage stay in place. When the weather is wet, I add a piece of electric tape to help keep everything in place even longer. Scalpel – You may not want to use a scalpel but it is good to have a few new ones in the farm first aid kit. I am not going to go into whether or not you should do any surgical cutting on your livestock. I just think a scalpel is a good thing to have on hand. They are cheap at the farm supply store. Penicillin Injectable – I am not recommending in any way shape or form that you go about randomly deciding to dose your animals with antibiotics. However, the farm supply store has this for sale and in the event of a major wound, the vet may agree that you should go ahead and inject a suitable dose into your animal, via intramuscular injection, (IM) until the vet can get out to treat the animal. Please do not go about deciding this for yourself unless you are extremely knowledgeable about dosing animals with antibiotics. We keep this in our family refrigerator as a precaution and only use as directed. Along the same line, I stock small gauge syringes and needles. It is a good thing to have these on hand as a precaution. 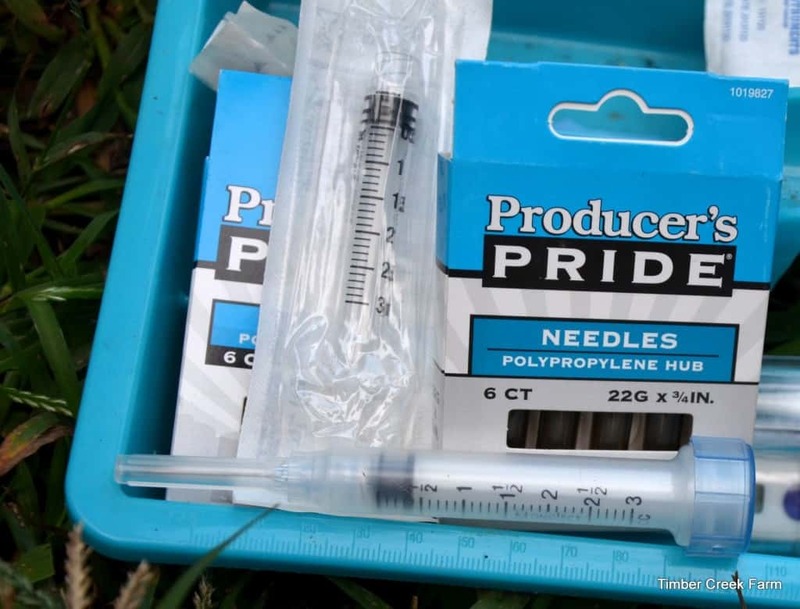 Small livestock require small gauge needles and smaller syringes. These are often not found in the local feed supply store. I have ordered smaller gauge needles from Hoegger Goat Supply, and Caprine Supply. 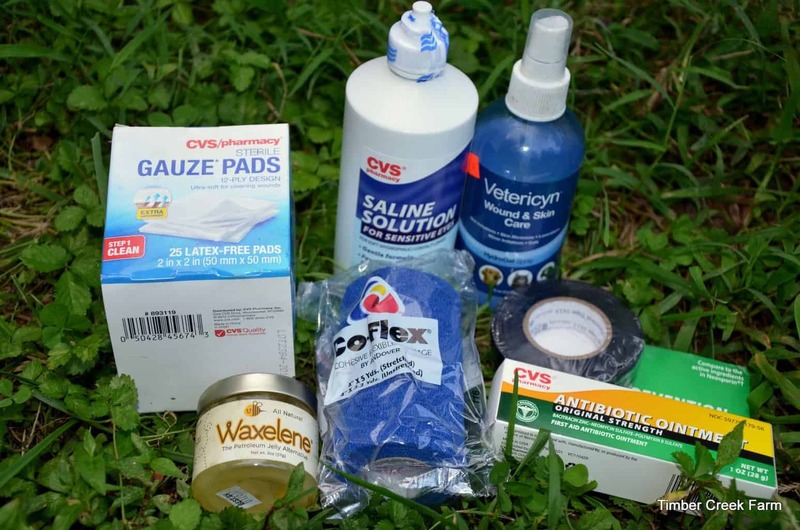 Wound Care Sprays, and Ointments– No farm first aid box is complete with out Vetericyn, Neosporin and BluKote. These are products I use frequently. Blue Kote is an antibacterial and anti fungal spray that also coats the area in blue color. Particularly in chickens, a red wound can be an open invitation to pecking and cannibalism. Spray even a small red area with BluKote to avoid the issue. Vetericyn is a commercially available wound spray. In my opinion it is worth the rather high cost. 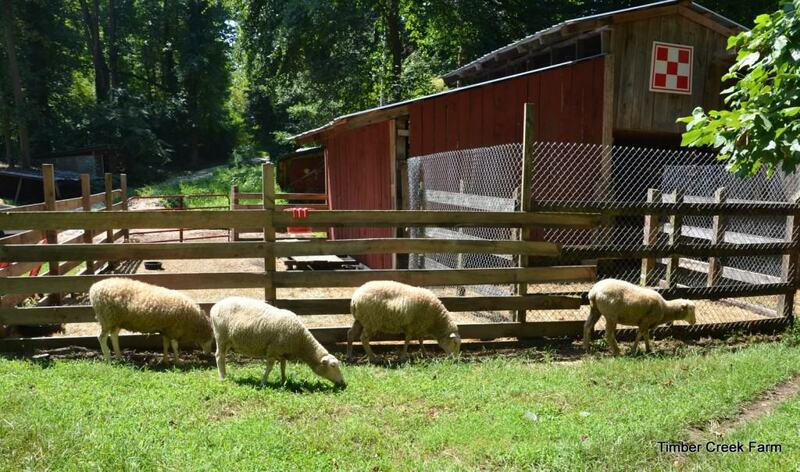 We keep it on hand and use it for all the animals and pets on our farm. Neosporin is widely available. Be sure that you buy the original formula and not the type with pain reliever in it. The pain reliever is often toxic or not tolerated well by animals. Corn Starch – Corn starch will clot blood and is a natural product to have on hand when working with animals. 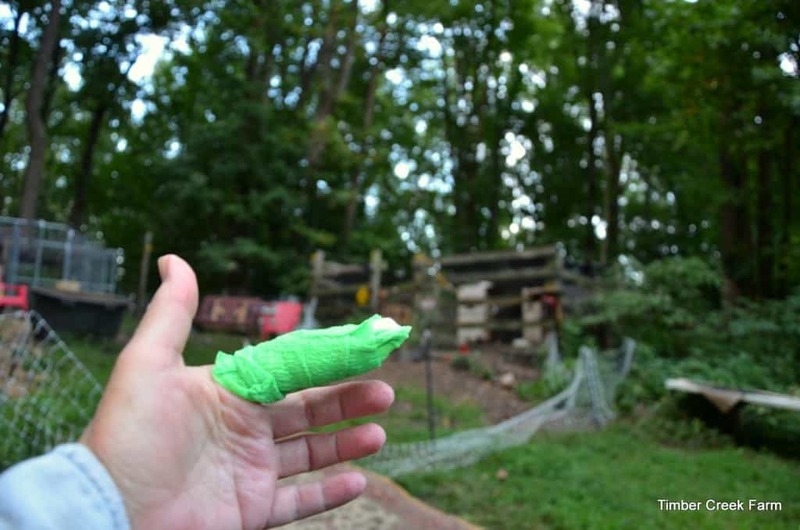 It is possible to accidentally nick an animal while trying to help or administer first aid. If you do, grab a handful of cornstarch and apply directly on the bleeding area. The blood should stop quickly. Hoof Trimmers– I recommend these in your farm first aid kit even if you have the farrier trim goat or sheep hooves regularly, for you. We do all of our own hoof trimming and occasionally a hoof needs just a quick trim to keep it healthy. If you have goats or sheep, you should have hoof trimmers available. Apple Cider Vinegar – Apple cider vinegar is a great probiotic that can be added to the water of your farm animals. Just a tablespoon or two per gallon will help keep their digestive tracts in good health, and help ward off illness. Baking Soda– Especially for small ruminants. Baking soda is a good thing to offer regularly to keep the rumen functioning optimally. It can also be used when the rumen stops working properly. Treats – Lastly, I recommend that you keep some favorite treats on hand for situations where you need to catch an animal in order to administer first aid. I have meal worms and sunflower seeds in our farm first aid kit. The sunflower seeds are a favorite of the chickens and the goats. Meal worms make the chickens and the ducks happy. Often a handful of green grass will help a rabbit over the scary time of being treated. 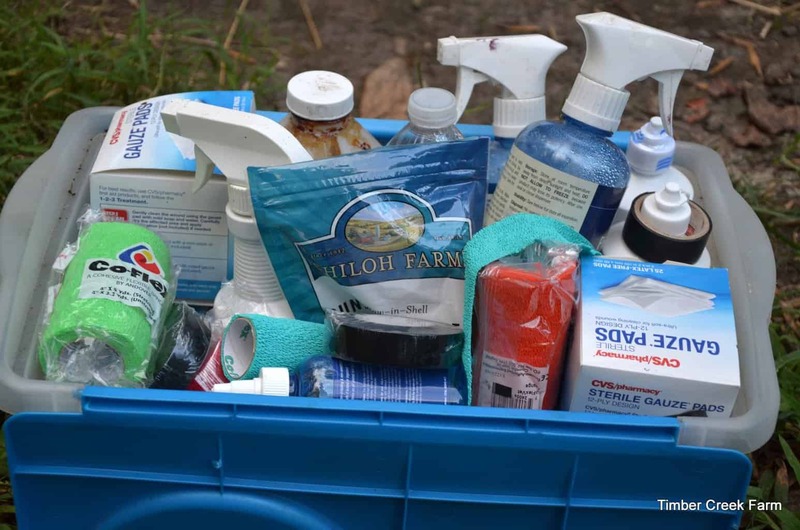 Occasionally, review the contents of your farm first aid kit and replace stale or old products. Many of the products I have listed here will have a very long shelf life and will not often require replacing. Being prepared on the farm or homestead will help you to feel more secure and self reliant, as you go about your day to day routine. Disclosure- This post contains affiliate links to products that you can purchase. While your price remains the same, if you purchase through one of the links, I receive a small amount of money in return for promoting the product. I never recommend a product that I do not personally use and can stand behind with my recommendation. Every penny earned helps us to continue this blog and to share and educate about small farming practices. 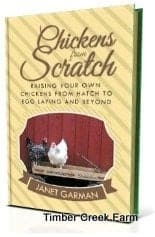 Have you checked out my new book? Awesome tips. 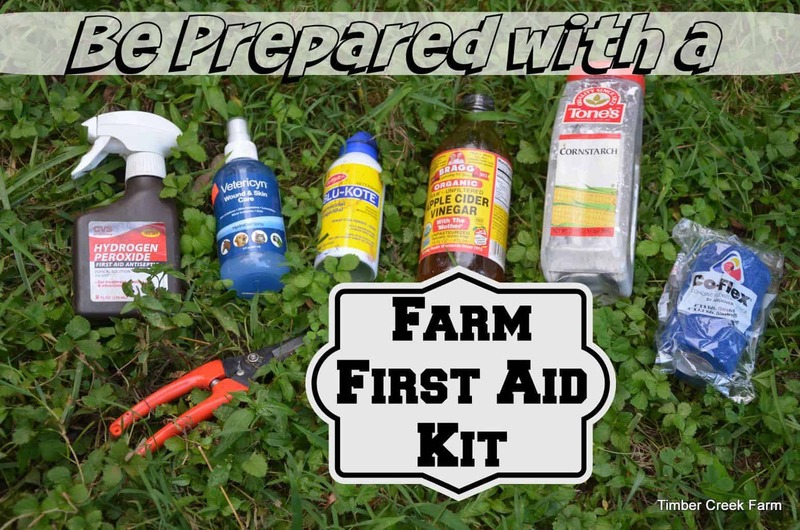 I am not on a farm, but I could certainly benefit from most of this in my at-home first aid kit. We are still working on our First Aid Kits, thanks for the good points… I need to talk to my health care worker, there are things I would like to have, such as antibiotics, and backup drugs that I use… Not sure if they will accommodate, but worth a try. Thanks for that idea Karen. Always a good idea to at least ask. The worst that can happen is they say no.